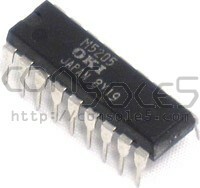 New old stock M5205 speech synthesis chips used in the Turbo CD / Turbo Duo family, as well as numerous arcade Games. If in game speech is distorted or missing and a recap doesn't fix it, this chip has probably gone bad. For more information, see our M5205 Wiki page.